Phaedra is a tale of unbridled desire. In Greek mythm, Phaedra is the daughter of Minos, King of Crete, and Pasiphae who was cursed by Poseidon to lust for a bull and conceive the Minotaur. Stepmother to Hippolytus, the youthful son of her aging husband, King Theseus, Phaedra's desire for the rejuvenating powers of youth make her vulnerable to a passion that lures her into the deceit that will eventually destroy her house. 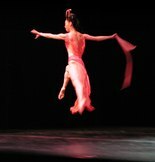 Martha Graham's Phaedra envisions its human protagonists as pawns in a rivalry between the gods. Aphrodite, Goddess of Love, desires Hippolytus, but he prefers the chaste Artemis, Goddess of the Hunt. Jealous, Aphrodite takes her revenge by planting in Phaedra an uncontrollable desire for her step-son. At the pitch of her lust, she chooses to lie, even as she sees, in a nightmare vision of the past and of Pasiphae's debauched passion, the precursor to her own tragedy. Believing Phaedra's lie, Theseus drives his own son from the kingdom and thus to his death, while shamed and desperate, Phaedra takes her own life. Dancers: Christine Dakin as Phaedra, Tadej Brdnik as Hippolytus, Kenneth Topping as Theseus, Erica Dankmeyer as Artemis, Miki Orihara as Aphrodite, Alessandra Prosperi as Pasiphae, and Alejandro Chavez, Christophe Jeannot, Ari Mayzik, Maurizio Nardi, Constantine Torlidakis and David Zurak as The Bull Dancers.